Our go to solution is to put together a cheese and charcuterie board, some crackers, nuts, pickles, open a beer and dig in. Simple, almost no effort. At our house this never fails because we love cheese and cured meats and always, always have some on hand. First, I had beaten joined the holiday crowds by ‘proactively’ doing my grocery store rounds right after an early morning gym workout and bought a huge container of feta in brine. (Sooo many people shopping!!). Second, Chris had bought a growler of our favorite locally crafted pilsner. We love this one brewery called Zwei Brewing Co. and will post more about it soon. Finally, we currently have an oregano plant that I haven’t yet killed, so fresh oregano was granted. Dinner literally took ten minutes to put together. 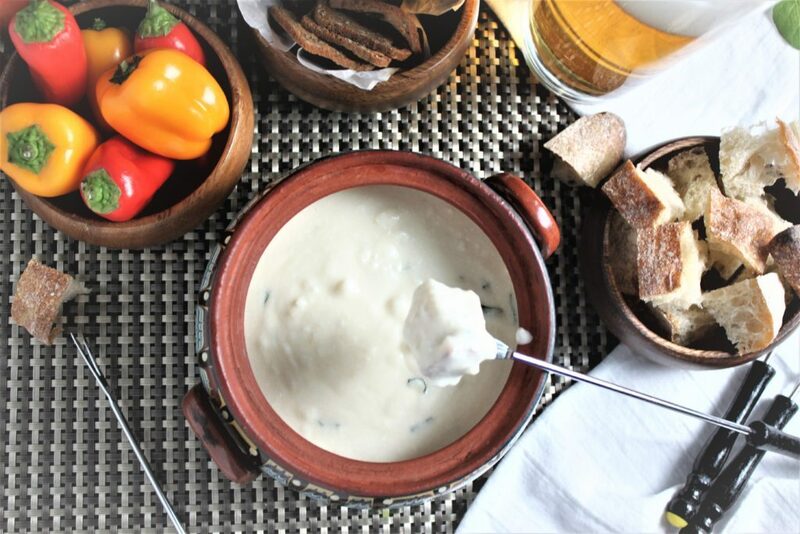 Chris made the feta cheese beer fondue. I set the dinner table, cut some bread, took dipping friendly veggies out of the fridge (peppers and cherry tomatoes go best with feta, I guarantee you), some fig crackers out of the pantry, poured us each a glass of Pils…and snapped a few pictures before we sat down to eat. I know, I worked much harder. I must, I simply must, underline that the quality of the feta cheese is crucial for this recipe. You cannot make it happen with the dryish, super salty feta crumbles that you get at most stores. You need to buy feta in brine. It is a solid block of feta sold immersed in a salted water brine which keeps it fresh and prevents it from drying out. This kind of feta is very creamy. Always choose sheep’s milk feta over cow’s milk feta if you have the option. When made with sheep’s milk it is even creamier. Not that I am a cheese monger, but I have eaten loads and loads of feta in my life and know a thing or two by now:). Contrary to popular belief, Greek feta is not the best one. The less talked about Bulgarian feta is beta! I promise. Last night though, we used extra creamy Greek feta in brine. Sometimes I cannot find Bulgarian sheep’s milk feta. When you first open the box, taste the feta cheese to determine if it isn’t too salty for you. If so, discard about half of the brine and replace it with filtered cold water. 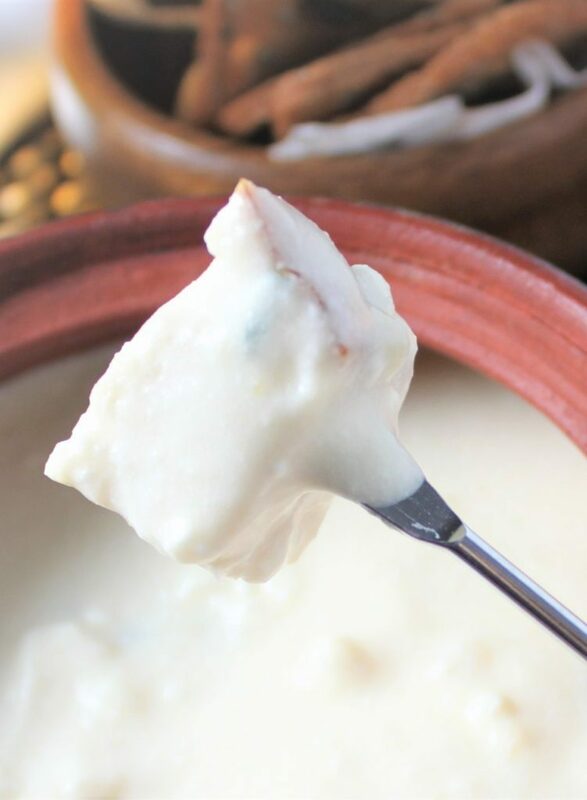 Through osmosis, salt will find its way out from the cheese into the water and the saltiness will be moderated. But it will take a few hours, perhaps even a day. If still too salty (unlikely), repeat. 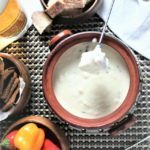 We prefer using a true German or Czech style pils in this fondue recipe because of their typical herbal and bready flavor profiles. By all means do not use a beer that has been made with loads of American hops. American hops even though incredibly aromatic are high in alpha acids which are the source of beer’s bitterness. 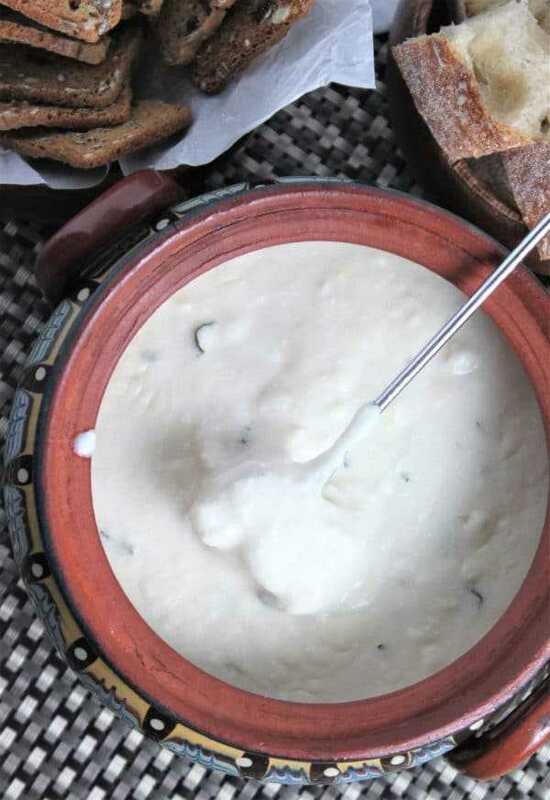 Their bitterness factor is more intense than that of the Noble hops traditionally used in German and Czech pilsners and will impart flavors you do not want in this fondue. And here you go! Enjoy! Super quick and easy, rich in flavor! Start by rubbing the bottom and the inside of a saucepan or a small pot with the garlic clove halves. Add the beer and place on a stove over medium heat. While waiting for the beer to start simmering, mix together the feta (crumble it with a fork first), ricotta, butter and flour. Once the beer begins to simmer, slowly start adding the cheese, butter and flour mixture. Stir slowly for about 3-4 minutes until well incorporated. Add the minced fresh oregano and give a final stir. Remove from stove and pour into a fondue pot.